1. 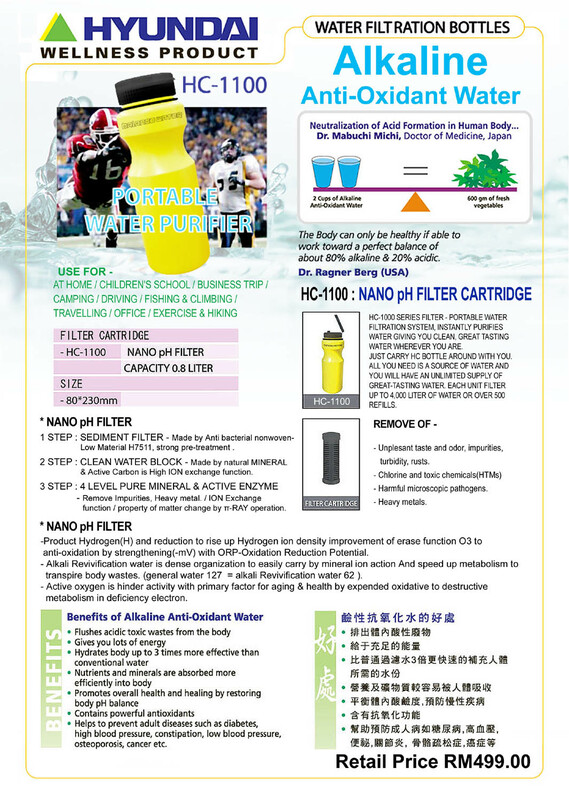 STEP : SEDIMENT FILTER - Made by Anti bacterial nonwoven - Material H7511, strong pre-treatment . 2. STEP : CLEAN WATER BLOCK - Made by natural MINERAL & Active Carbon is High ION exchange function. - Remove Impurities, Heavy metal. / ION Exchange function / property of matter change by π-RAY operation. HC-1100 SERIES FILTER - PORTABLE WATER FILTRATION SYSTEM, INSTANTLY PURIFIES WATER GIVING YOU CLEAN, GREAT TASTING WATER WHEREVER YOU ARE. JUST CARRY HC BOTTLE AROUND WITH YOU. - Unplesant taste and odor, impurities, turbidity, rusts. - Chlorine and toxic chemicals(HTMs). -Product Hydrogen(H) and reduction to rise up Hydrogen ion density improvement of erase function O3 to anti-oxidation by strengthening(-mV) with ORP-Oxidation Reduction Potential. - Alkali Revivification water is dense organization to easily carry by mineral ion action And speed up metabolism to transpire body wastes. (general water 127Hz = alkali Revivification water 62Hz). - Active oxygen is hinder activity with primary factor for aging & health by expended oxidative to destructive metabolism in deficiency electron.